Metrokane calls this the easiest squeeze on Earth, but a manual juicer that applies more than one thousand pounds of pressure doesn't need a cute name to convince people of its power. The device operates with the pull of a lever and offers more than twice the leverage of other juicers. The all metal body has a polished chrome finish, but a stainless steel cone, funnel, and pouring pitcher. This is a good choice because the steel resists corrosion and won't affect the flavor of your juice. The stainless parts can all be removed for cleaning or serving. The juicer works with all types of citrus fruits. The product has a lifetime warranty on the moving parts as well. Brute strength is not required to use this juicer, making it ideal for anyone who has trouble applying the pressure that other manual juicers require. As it doesn't spin to work the juice from the fruit, it won't tear into the rind, making bitter deposits in your juice. The machine struggles a little with larger grapefruit and may not handle the smallest sized citrus as well. It also requires a space able to accommodate its height. Fresh juice is worth the added steps, unlike anything you can find sitting on the store shelf. 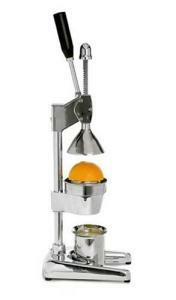 Here's another citrus juicer to consider.